Luxaire® Split System air conditioners deliver the quality and dependability you need to keep cool in the hottest weather. Energy efficient models make it easy to satisfy your budget and comfort level.Acclimate™ Series split system air conditioners are ENERGY STAR® qualified models that offer at least 15% to 25% higher energy efficiency than standard models — plus, an innovative Silent Drive™ Comfort System for very silent operation. Up to 18 SEER2 - 5 tons R -410A Communicating control capable/Efficient two-stage compressor Silent Drive™ comfort system Lifetime limited compressor warranty 10-year limited parts warranty** System must be registered online within 90 days of installation. Otherwise the parts warranty reverts to a 5-year limited parts warranty. 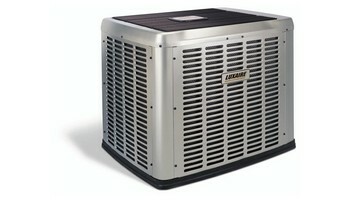 LX LXSeries Split System Air Conditioners LX Luxaire® heat pumps provide year-round heating and cooling with engineered quality you can count on at every performance level in every season.Series split system air conditioners fit your needs with select ENERGY STAR® models that reduce your utility bills and Micro Channel Coil Technology that provides more cooling in a smaller footprint. Up to 16.5 SEER 1.5 - 5 tons Single-phase R-410A Micro Channel coil technology 10-year limited compressor warranty 10-year limited parts warranty** For 10-year limited parts warranty, system must be registered online within 90 days of installation. Otherwise the parts warranty reverts to a 5-year limited parts warranty. Does not apply to R-22 models, 3-phase models or internet sales.